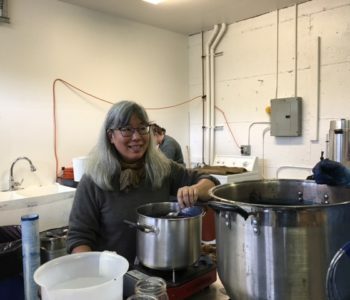 I went to Seattle to take a natural indigo vat making class with Kathy Hattori of Botanical Colors. I learned a lot about different kinds of indigo vats. I think I like the henna vat the most. Everyone was awesome. I took the class with artist Stephanie Sykes who was a hoot! I looooooove learning new stuff. Check it out! 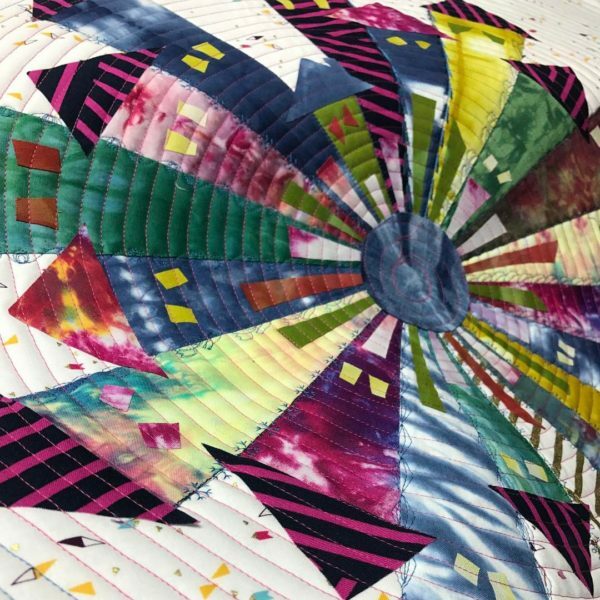 Kim Lapack of Persimon Dreams and the famous Project Quilting has been sewing with my fabrics! She came to a trunk show that I did at Millhouse Quilts last summer and bought some. Yes, there are other fabrics in there as well. 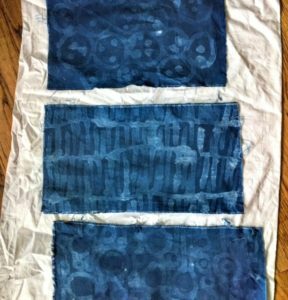 Mine are the indigo (duh) and the hand dyed mustard colored fabric. A friend just let me know that I have made a guest appearance on Sewing With Nancy and I didn’t even know about it. It’s really just a half second of a picture of me during the Monona Library Mending Day. It was a teeny tiny part of a larger story about the amazing and fantastic Sewing Machine Project. The interview about The Sewing Machine Project starts about 20 minutes in. A girl can dream: In my head, I’ve made several recent guest appearances. Jenina and I have been recording some of our thoughts about our Deep Into Indigo Retreat plans. Also, adding many pretty pictures, because pretty is what it’s all about. Also fun. Also food. Also Friends. The best F words. This year the Deep Into Indigo Retreat has a new location. We talked about it yesterday and threw together this little video about it. You can find more info here. We hope you join us!! Deep Into Indigo Retreat 2017!! We’re baaa-aack! 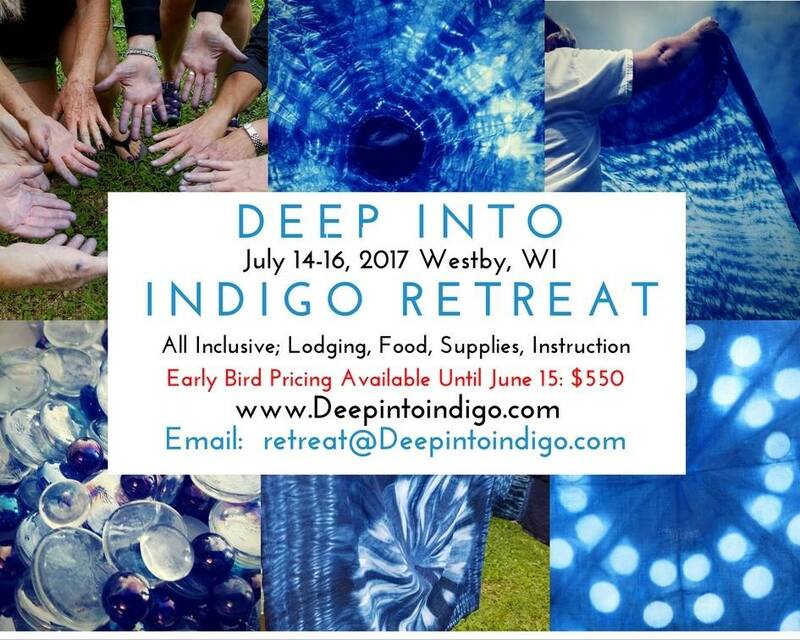 We had so much fun at the Deep Into Indigo Retreat last year, that we are doing it again this summer. The only changes are that we’ve moved to a more spacious location AND the food will be inspired by the holiday happening on the weekend we are retreating: Bastille Day! Click the picture for more information. We hope you can join us! I made a mighty mess. It’s one of my favorite things to do. I mixed up some rice flour and Gum Arabic, which is also known as sugar glue. It’s made with the sap from the acacia tree. 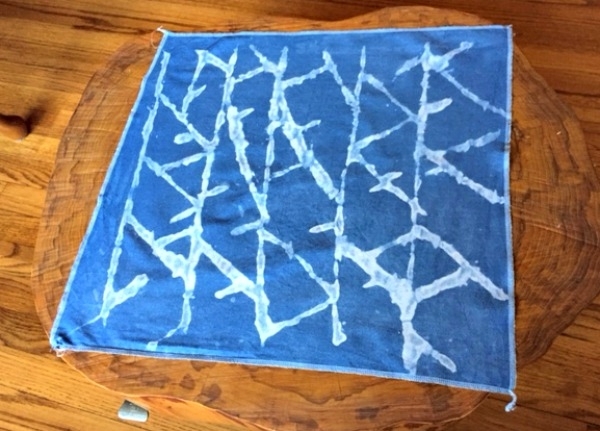 I had tried to make a resist from just Gum Arabic – I swear I read a tutorial for that somewhere – and it didn’t really resist the fabric very well. Here’s the Gum Arabic alone: Nice, but a little too subtle for me. I wanted to make something resist-ier. Hence, the rice flour. I just stirred a little at a time in to my leftover Gum Arabic goo until it was the consistency of glue…I guess. Then I painted it on. 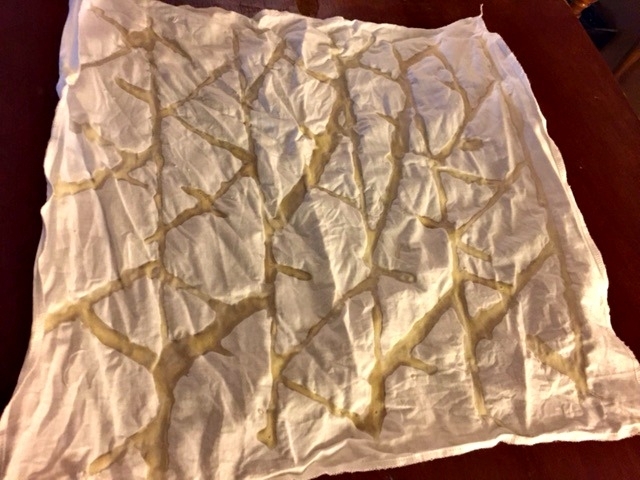 I laid the fabric on some wax paper because it bleeds though. It dried really fast, though. I was messy and didn’t really think much about the pattern. 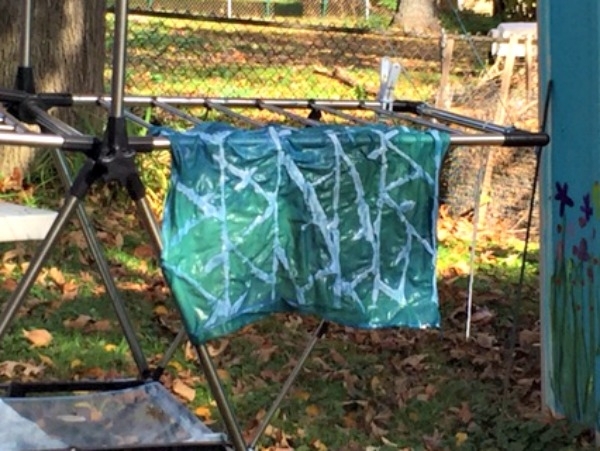 It was drippy and messy to work with and, for me, that makes it fun. Here it is after a coupla dips. The resist did get sticky again. I left it to dry for a few days though I think 24 hours should be plenty. We run out of good dye days in Wisconsin pretty early and I had to wait for the weather. I think I dipped it three times. The vat was old so the result is light. Boom! I love the level of resist I got. There are some bonus little drippy bits here and there. My random pattern makes me happy too. I will do this again for sure. I can’t be forever dyeing! Sometimes I like to dig into old news. A nice big pile of linen can be seriously inspiring. So are these gorgeous pojagi. 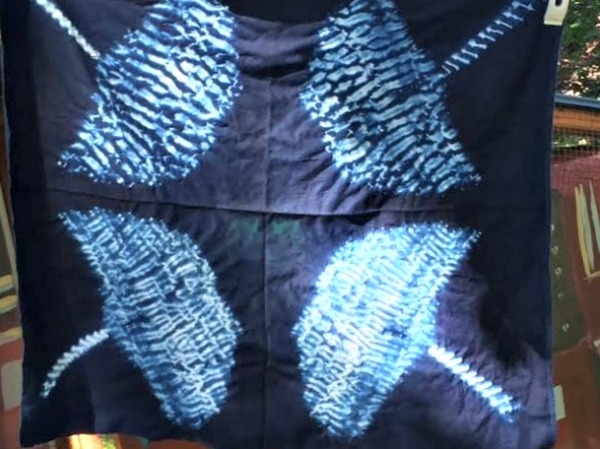 Not really quilts, though pieced like one, a pojagi is a Korean wrapping cloth. 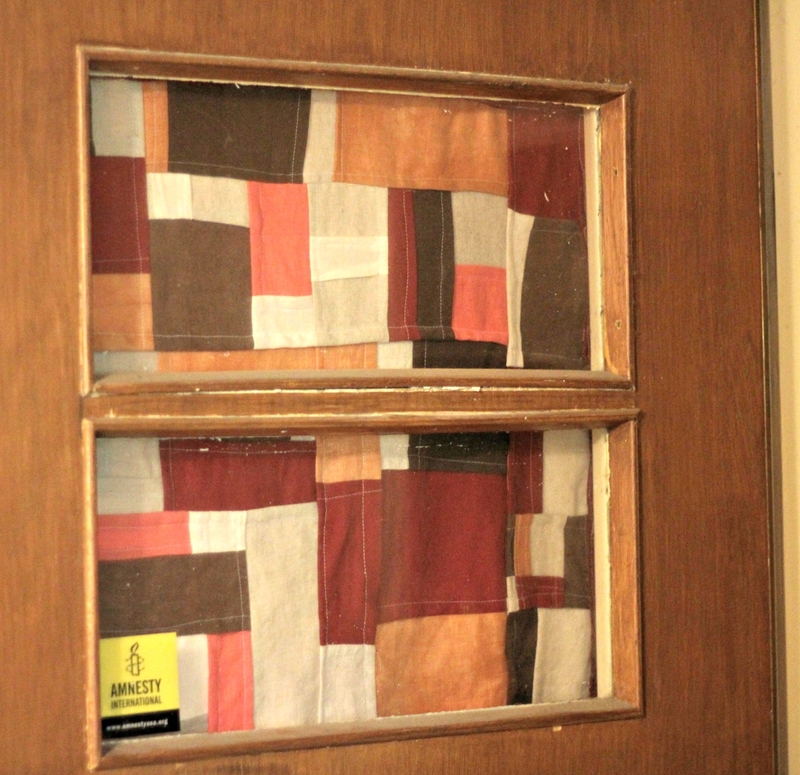 I was suddenly struck with how ugly the curtain on the door to the garage was. It’s been there as long as we’ve owned the house and has always escaped my notice. It’s a perfect storm! Drop everything and MAKE STUFF!! Notice the aluminum square to the left of the pile. I cut it up with scissors every now and then to sharpen the blades. It worked for a short time and was helpful because my scissors are overdue for a sharpening. But I digress – Check out those orange pants. They were at my local thrift shop and I had to have them. They were 100% linen, Ralph Lauren and PINK. I thought I could dye them brown but stupidly picked up the terra cotta dye (WHY?) and they went horribly orange and – even if I had grabbed brown – fatally splotchy. I put them into storage for years. 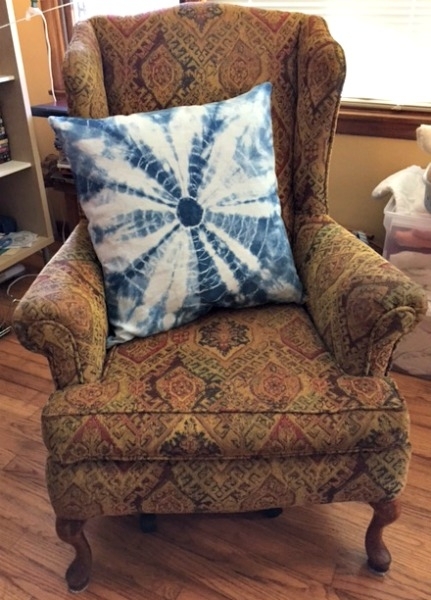 This is one of the first dye jobs I ever did. 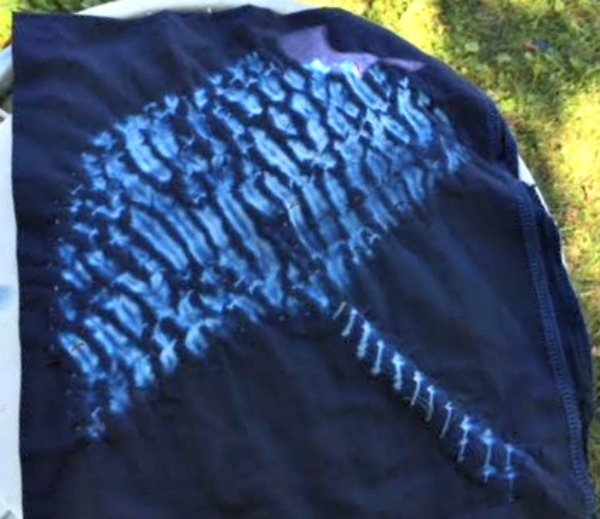 Now I know how to pre-treat fabric so it dyes evenly.  But – AND THIS IS IMPORTANT – you have to do stuff wrong first before you do it right to really learn…climbing off soap box… Also, easy come, easy go. I can always cut things up and make them into something else. 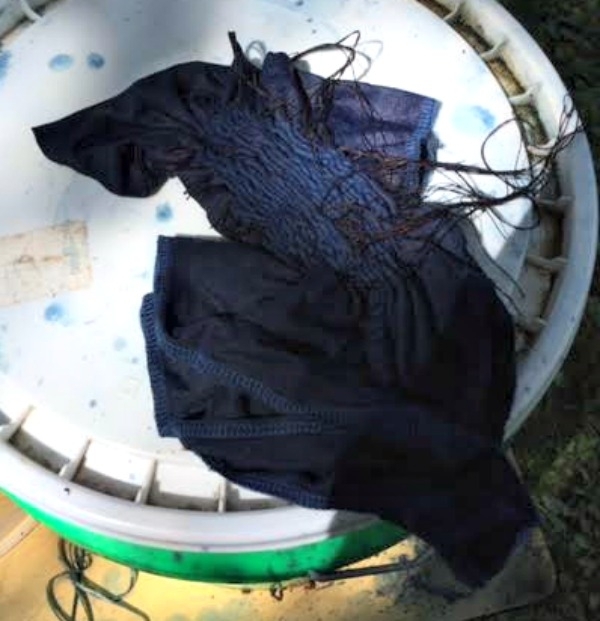 So, I cut up several linen pieces (5 pairs pants, 1 red dress, 1 white shirt, 1 orange top) and ironed the bejeebers out of them…so satisfying to get rid of those bejeebers. 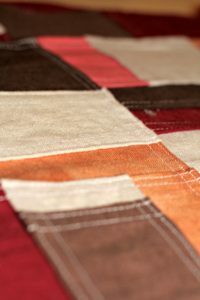 I then cut them into smaller squares without giving it too much thought. 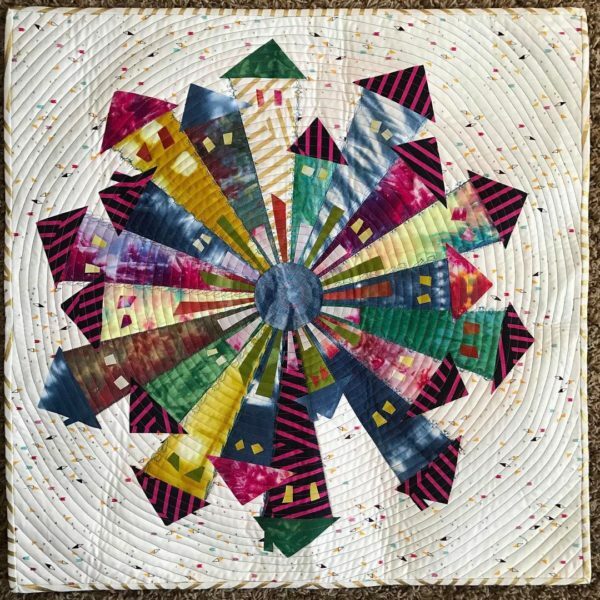 I wanted random sizes for a crazy quilt look. One of the many cool things about pojagi‘s is that they have no wrong side. I think this kind of seam is called a flat felled seam but feel free to correct me. I layered the square on top about 1/2 inch lower than the edge of the bottom square. 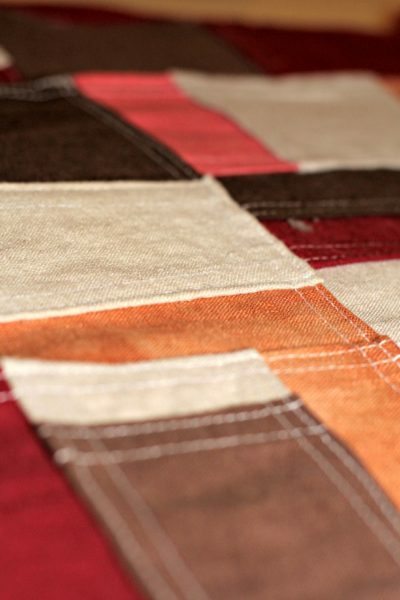 I sewed the seam down at about 1/4 down from the edge of the top square. There is a whole lot of ironing involved with this process but linen is happy to be ironed. I ironed the overlap from the bottom square into the seam allowance. Tada! The Final Curtain. I rushed the end – it was dinner time – so the top is messy. I should, and one day may, redo it but I’m just going to leave it for now. It makes me happy. 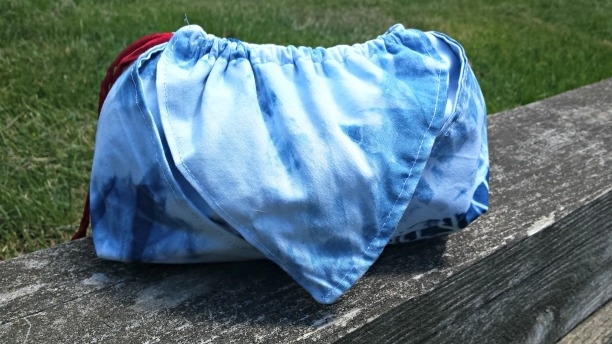 Here’s one of the other cool things about pojagi, because they are not quilted – they don’t have to be because the seams are totally enclosed – they are as sheer as the fabric used and look amazing with the light behind them. 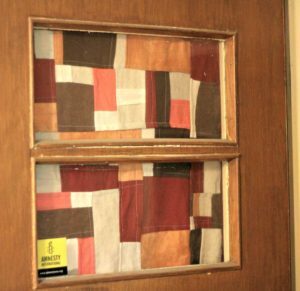 Perfect for curtains in a place where privacy isn’t important. I have the best view from inside my garage. Since that view just isn’t observed by everyone, I plan on making another for the kitchen window that looks out to the yard. I feel like the colors have a fun ’70’s vibe. I like being able to follow my nose and make things in an intuitive way. It’s a great project for people who don’t need a plan to follow. But, I’m sure planners could make a nice tidy pojagi, if that’s what they’re into. I’ve cut out several more and just need to throw them together. Ha. I was trying for a ginkgo leaf. It was a whole lotta stitching, which I really enjoy. But, it’s more of an umbrella. It was more of a design issue than a technical thing though. I really love it. And what’s better than one Ginkgo- brella? Four Ginkgo-brellas!!!!!!!!! I love learning stuff!!! I’ll be making more…that are maybe a little more leaf like. I’m so lucky to have the help of Jenina Mella. In addition to doing most of the organizing and all of the cooking, she’s been trying out bag designs for our retreat swag bags. 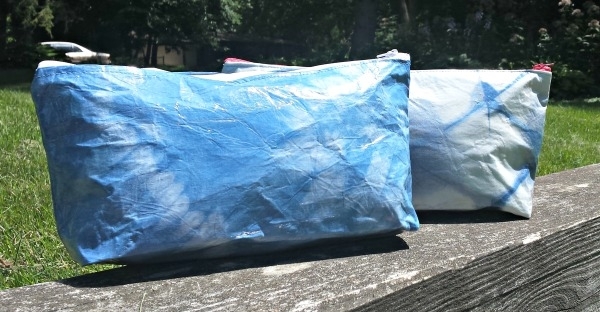 These are laminated envelope bags And this one (my favorite) is a clever origami drawstring style bag. She’s a super talent! The retreat is getting closer and closer, I can’t wait!! !